Hospitality Financial and Technology Professionals (HFTP®) is pleased to continue its partnership with the Emirates Academy of Hospitality Management (EAHM) through the addition of two new scholars to its Middle East Research Center: Mercy Kiprotich and Vladan Pantelic. The HFTP Middle East Research Center, along with the HFTP Americas and Asia Research Centers, are an essential component of HFTP's initiative to provide members with quality new resources and information that advance the global hospitality industry. Kiprotich and Pantelic are currently pursuing their master's degrees and will be delving into research that provides new insights in hospitality management in the United Arab Emirates. Both scholars were carefully selected by EAHM, and will conduct their research under the supervision of Dr. Sanjay Nadkarni, Ph.D, Director of EAHM's Innovation and Research Center. Leading up to their graduate school careers, both Kiprotich and Pantelic boast impressive backgrounds in the industry. "We are fortunate to have Mercy and Vladan join the HFTP Middle East Research Center," said HFTP CEO Frank Wolfe, CAE. "While their futures are bright, their prior industry experiences alone have set them apart from their peers. As research scholars, their contributions will help HFTP advance industry knowledge." Prior to her studies, Kiprotech worked extensively in hospitality, building her international, hands-on experience in event planning, sales performance analysis, and property management. As a graduate student, she is diving into her thesis investigating how Dubai hotels are beginning to leverage blockchain technology. Pantelic, who has vast experience in operations with Jumeirah Hotels & Resorts, will use his knowledge to focus his thesis on the selection of key performance indicators by hotel management in the UAE. HFTP will provide a platform for the dissemination of the scholars' findings through whitepapers and blogs. Hospitality Financial and Technology Professionals (HFTP®) established in 1952, is an international, nonprofit association, headquartered in Austin, Texas, USA, with offices in Hong Kong, United Kingdom, the Netherlands and Dubai. HFTP is recognized as the spokes group for the finance and technology segments of the hospitality industry with members and stakeholders spanning across the globe. HFTP uniquely understands the industry's pressing issues and assists its stakeholders in finding solutions to their challenges more efficiently than any organization. It does this via its expert networks, research, certification programs, information resources and conferences/events such as HITEC. HFTP also owns the world's only hospitality-specific search engine, PineappleSearch.com. For more information about HFTP, email membership@hftp.org or download the HFTP/HITEC media kit via the HFTP website. 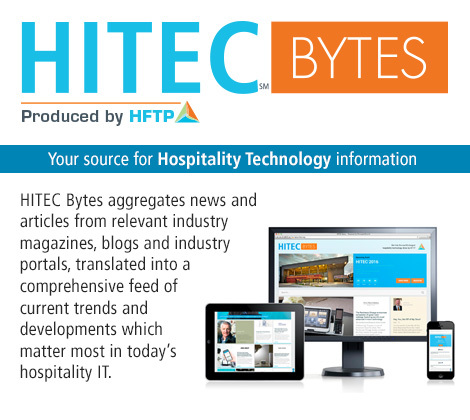 Read industry updates on the suite of HFTP hospitality news sites: HITEC Bytes, Club Bytes, Finance Bytes and HFTP News.